MiniHobby Models is based in China. I looked them up on the internet, because this is the ONLY one of that brand kit I have. They make all manner of different subjects in various scales. This kit comes in a long sturdy shrink-wrapped tray and lid type box. The box art shows a Type IXC U-Boat submerged and being depth-charged by a destroyer. One side panel shows 4 color box arts of other ship models that this company markets, but only their kit numbers and no name as to what they are. I found out their identity on a web site where they are sold. Kit no. 80910 is a 1/700th scale German Bismark, 80911 is a 1/700th scale Japanese Yamato, 80912 is a 1/700th scale U.S.S. Bunker Hill and 80913 is a 1/700th scale U.S.S. Spruance. The other side panel continues with 3 more box arts. Kit no. 80914 is a 1/200th scale Type IVB U-Boat, 80916 is a 1/700th scale German Gneisenau and 80917 is a 1/700th scale German Scharnhorst. These three box arts are followed by the statements “Contains one unassembled model kit and easy to follow pictorial instructions. Paint and cement required to complete the model as pictured on the box. Kit is suitable for ages 10 to adult. Scale is 1/200th. “ This is all said in English, Spanish, German, French and Chinese with color illustrations labeling each text with the flags of the countries that speak those languages. MADE IN CHINA also appears here. The inside of this box is blousy. It is 2” too long and 1” plus too wide, creating a letter L void around the parts. The kit contains a single red hull bottom part and a single grey deck part, both in a sealed cello bag, There are 2 grey parts trees in another sealed cello bag. The instructions complete the contents. The instructions consist of a single sheet in 8 ½” x 12” format printed on both sides. The face side has a black and white repeat of the box art at the top, followed by the first 4 assembly steps. The reverse side continues with 4 more assembly steps, for a total of 8. There are NO parts trees illustrations in the instructions. A search of the trees will have to be needed each assembly step to find the right parts needed. Bad move MiniHobby! The largest grey tree is the letter B one. It holds: propellers, torpedoes, railings, display base parts, periscopes, rudders, conning tower platform guns, the main deck gun and 5 crewmen etc. (69 parts) Strangely, 3 of the crewmen are posed saluteing. There are no decals in the kit. Some U-boats carried designs on the sides of the conning tower. A decal sheet with a selection of these would have been nice in this kit. Assembly is very simple, with few parts needed per assembly step. 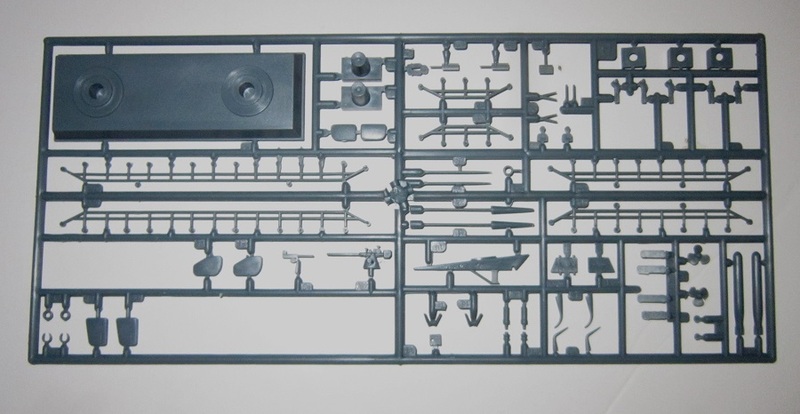 This kit is a very good one for novice or beginning ship modelers. I recommend it to them highly. I bought my kit on sale at my local hobby shop.